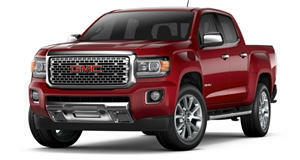 With a range of engines, gearbox and choice of driven wheels, the GMC Canyon give potential buyers plenty variety. Of the 3 engines, the 181hp and 369 lb-ft Duramax diesel grants a massive 7700lbs tow capacity, while the 8-speed auto offers a specialized tow function. The Denali trim package equips 20-inch alloys, a heated leather steering wheel, and a premium Bose sound system. Safety features include electronic stability control, with the option of forward collision alert, and lane departure warning. The lack of a long box with the crew-cab cuts short the Canyon’s full potential. 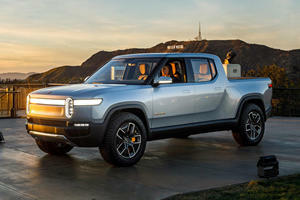 The other half of the General Motors mid-size pickup twins, the GMC Canyon is almost identical to the Chevrolet Colorado. Offered in the same body styles, with the same engine and transmission options, and identical economy figures, there’s little that separates the two. But there are slight differences between them in an attempt to establish the GMC as the more premium model. Marginally more expensive across the range, starting at a MSRP of $20 885, is the extra cash really worth it though? Matching the interior of the Colorado for design and layout, the GMC Canyon is a great place to sit. Space for 5 adults is generous, with large amounts of head and leg room for both front and rear occupants. Cabin quality is premium, with softer touch materials in here than you’ll find in the Chev, though noise insulation is just as good. A range of colors and interior trims, including aluminum inlays are available. Though a 4.2-inch display is featured with the standard audio system, complete with Android Auto and Apple CarPlay, the SLE trim level is the one you’ll want for the 8-inch GMC infotainment system, as well as an assortment of other mobile-based apps and the 4G Wi-Fi Hotspot. Up to 4 USB ports and a 12-volt charging port are available depending on which trim level you choose. All models feature a powered driver’s seat and rear-view camera. Like the Colorado, the ride and handling of the Canyon is fantastic. While not maybe at the same levels as that of the Honda Ridgeline, it still offers a car-like experience when it comes to comfort. The lighter, more direct steering than many of its rivals makes it an absolute joy to use in parkades and tight places, and on the road it has a well settled composure that shrinks itself around the driver. Bump absorption is truly top notch, as is handling – minimal body lean, acute turn in, and sufficient feedback to still enjoy the drive, even if it isn’t that exciting. Load the cargo bed or hitch a trailer, and the ride settles further with the additional weight behind you – making it comfortable regardless of the situation. Just like the Colorado, 3 engines on offer are matched by 3 gearboxes – a 2.5-liter 4-cylinder gasoline engine boasts 200 horsepower and 191 lb-ft of torque and will safely tow up to 3500lbs, whilst a 3.6-liter V6 with 308hp and 275 lb-ft ups towing to 7000lbs with an optional towing package. But the least powerful engine is in this case possibly best… the 2.8-liter Duramax turbo-diesel has just 181hp, but with 369 lb-ft it’ll comfortably tow a gargantuan 7700 lbs. Pair that with a 22/30 MPG economy rating and it’s not hard to guess which engine is our pick. But specify it with the 8-speed automatic – the 6-speed auto is sluggish and lacks a tow/haul mode. Where other trucks in the segment offer a long box style cargo bay with their crew-cab models, the GMC Canyon doesn’t – only offering the 6ft 2in box with the cramped extended cab. But what the more spacious cabin may lack in cargo space, it makes up for in towing ability – especially with the Duramax diesel engine. Stabilitrak with traction control, trailer sway control, hill descent control, trailer brake control, and an automatic locking rear differential are all available to make towing less troublesome. 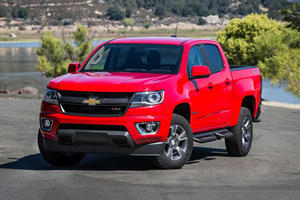 Additionally, the Canyon has a 4-star NHTSA safety rating, and a Good rating from the IIHS. Nearly identical in all aspects to the Colorado, the Canyon finds itself not only more expensive, but lacking the functionality that the Colorado affords in being able to spec the long box with a crew-cab. At the end of the day, the Canyon places a premium on exclusivity – whether it’s worth it is up to you. 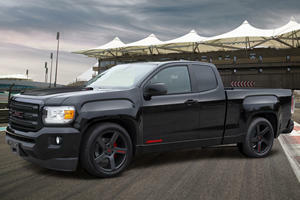 Only 100 limited-edition Syclone performance trucks will be built. It already has Amazon's $700 million in the bank. Will the death of the manual never cease?